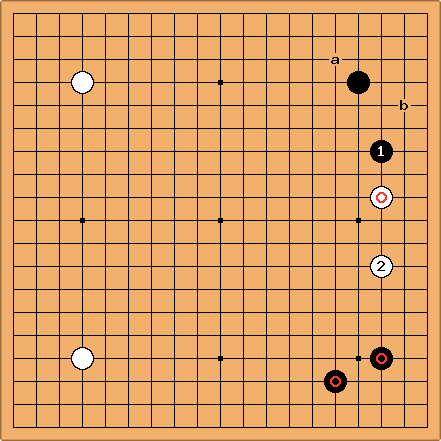 This Go proverb is meant for the situation in this diagram: White has just invaded at the 3-3 point below Black's 4-4 point (see 3-3 Point Invasion). On which side should Black block, at a or at b? The general rule is to block where your extension is wider or the potential moyo is larger. 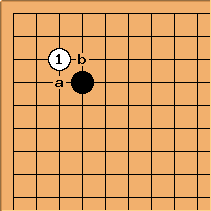 In this diagram is further away than (so it is the wider extension), so Black blocks at rather than a. Here and are at the same distance, but if one looks beyond it, the upper moyo still extends further than the left one, so again is the correct move. Emptyriver- Sorry, but could you explain this a little more. 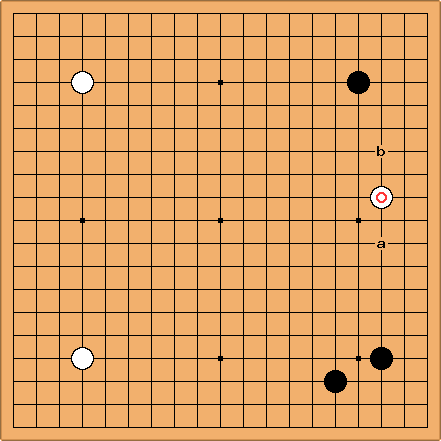 It seems like Black will want to protect the weaker side (the territory on the left side seems less secure) from White's influence. Jasonred If I'm not mistaken, the joseki does protect the weaker side. Anyhow, influence? what influence? 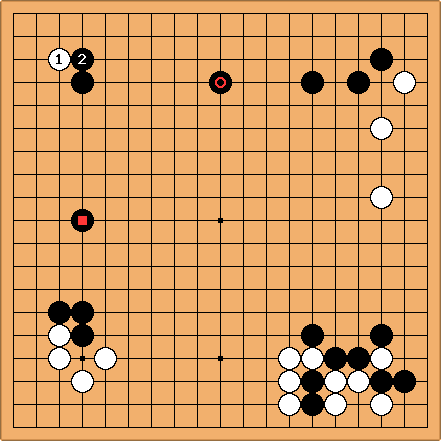 This usually leads to White gaining some territory, and Black gaining influence, no? 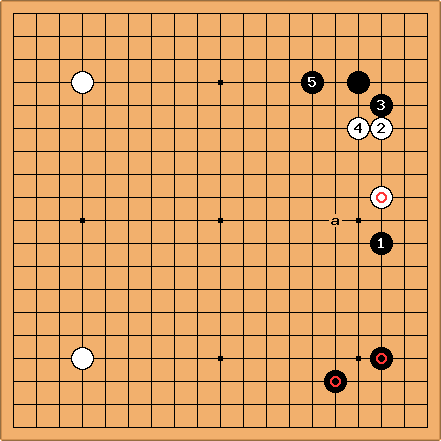 Of course, this is only joseki at kyu level, but good enough, I guess. 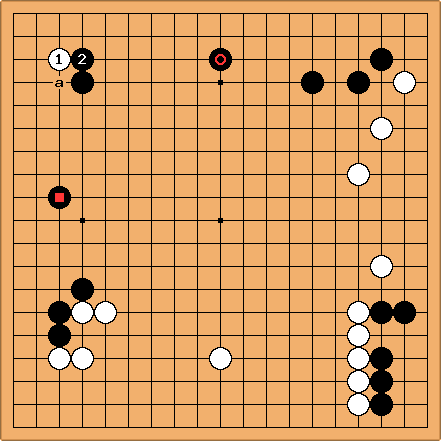 Even at kyu level, I wouldn't want to be White in this sequence, as the board was just too open to trade off the territory from san-san invasion for that wall! tderz: Blocking from the wider side means that you yourself will get more potential for territory, while the opponent will get less space, even lacking stability. 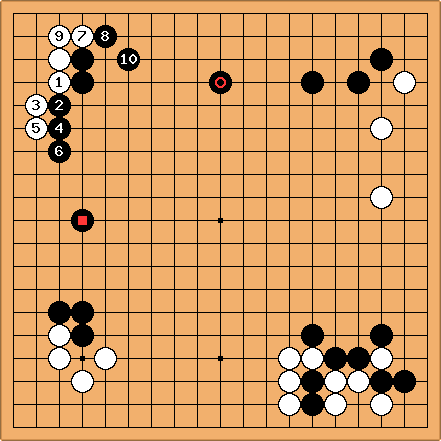 Correct: Black gets a wide extension from his -shimari and induces the natural corner moves + . The white position is cramped, imagine a (later) black move a! if Black closes the corner now with a, there are still later "imponderabilities" as b etc.